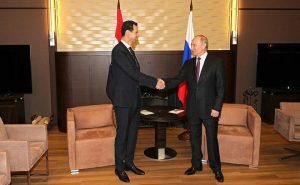 Sochi, SANA, President Bashar al-Assad held on Thursday a summit meeting with Russian President Vladimir Putin in Sochi during which talks dealt with the distinguished bilateral relations between Syria and Russia and means of boosting regional and international security and stability. During the meeting which was held in the presence of Russian senior military officers and officials, intensive talks were held about the fruitful cooperation in the field of combating international terrorism and the progress achieved as a result of this cooperation in the eradication of terrorism in Syria. The two presidents also discussed steps of the political solution in addition to the positive role played by Federal Russia in this domain. President Putin added that due to those military successes, additional and suitable conditions have been created to resume the political process track and a great progress was achieved in the framework of Astana process, another progress was gained during the Syrian national dialogue congress which was convened in Sochi. “And now we can adopt the forthcoming steps in a joint form as the aspired goal is to reconstruct economy and offer humanitarian aid to people in need,” said President Putin. President al-Assad, for his part, said “thank you Mr. President, in the beginning, I like to offer congratulations on the occasion of starting your new constitutional term and I believe that the outcomes of latest elections were an indication that the policies you have adopted, whether on the internal or on the international arena satisfied the Russian people who saw this step as giving Russia a bigger and bigger place on the international arena. “I am happy to meet again in Sochi after several months of our last meeting here, in fact, a lot of positive changes have been done between these two meetings, particularly regarding combating terrorism as the area of terrorists has become more smaller and during the latest weeks, hundreds of thousands of Syrians have returned to their homes and there are millions on their way to return and this means more stability, and this stability forms a broad door for the political process which has started since several years,” President al-Assad said. “Once again, I thank you, and avail the opportunity to thank the Russian military forces, in particular, the air forces, which played an important role in combating terrorism,” President al-Assad said. 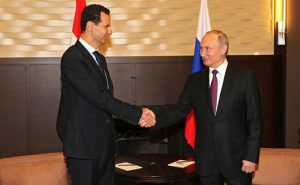 “In this regard, President al-Assad affirmed that he will send a list that includes the names of candidates to the membership of the committee on discussing constitution in the list of the Syrian government as soon as possible to the UN, and Russia welcomed this decision and supports it,” President Putin added. 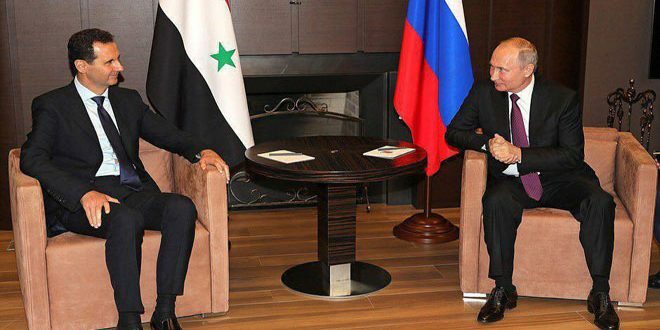 “I wish to thank President Putin and the Russian government which continued, during the phases of the crisis, offering the humanitarian aid to the Syrian citizens who have left different regions because of terrorism,” President al-Assad said. “We have also evaluated the political process during the latest months, particularly after Sochi conference,” the President said.